LAUPAHOEHOE, Hawaii, June 12, 2018 (GLOBE NEWSWIRE) — A new type of residential community, never seen before on Hawai’i Island, just received final subdivision approval, and properties in this landmark neighborhood are now available to the public. After more than 10 years of extensive research and effort, Big Island Sustainable Homes, LLP is pleased to announce the arrival of Kuwili Lani, (“to embrace the heavens”,) the first-ever sustainable agrihood on Hawaii Island. Infrastructure has been completed with lots within the gated subdivision ranging from mid $200K to mid $300K. Julie Keller, R(B), of Hawaii Life Real Estate Brokers, is handling sales for Kuwili Lani. Featuring 11 one-acre vacant lots zoned Ag-1 for agricultural use, Kuwili Lani is a planned intentional community designed to be low-impact, where residents can enjoy a sustainable lifestyle. 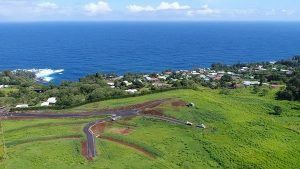 Situated along the Hamakua Coast in Laupahoehoe, careful consideration and planning went into every aspect of living in this truly one-of-a-kind subdivision. Emphasizing independence from the energy grid and wise use of natural resources, the community is designed with an array of renewable energy systems, including photovoltaic, wind, plus a combination of water catchment and County potable water. Homes in Kuwili Lani will feature the latest in green building practices. With each lot designed to take maximum advantage of the region’s rich soil, residents of Kuwili Lani are encouraged to grow their own food. Developer Big Island Sustainable Homes, LLP created Kuwili Lani in response to demand from people looking to live in Hawaii who are mindful about the environment. Kuwili Lani is designed for people who want to live where they have a low-impact on the land, while still enjoying the modern amenities of technology. For more information on Kuwili Lani and how to be a part of this innovative sustainable community, contact Julie Keller at (808) 987-7931 or email Julie@hawaiilife.com.